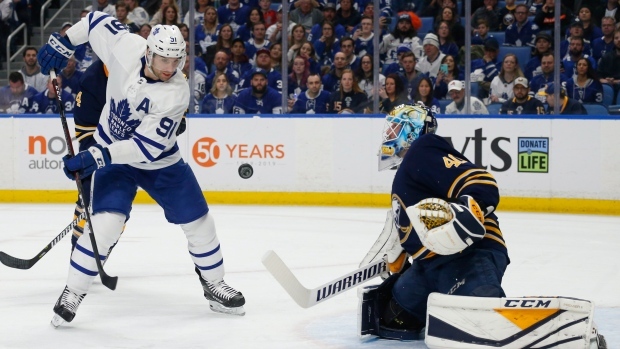 BUFFALO, N.Y. — Mike Babcock sensed his slumping Toronto Maple Leafs were showing signs of turning the corner. NOTES: Rasmus Dahlin's assist on Mittelstadt's goal upped the rookie's total to 38 points and moved him ahead of Bobby Orr for second-most by an NHL defenceman before his 19th birthday. ... The only player ahead of Dahlin is Housley, who had 57 points as an 18-year-old with Buffalo in 1982-83. ... Toronto swept the four-game season series over Buffalo and improved to 22-11-4 on the road — one win shy of matching the franchise record set in 2003-04.